Whale & Dolphin Conservation Society. encourage action to reduce marine pollution at source. The Beachwatch campaign is organised by the Marine Conservation Society with sponsorship from Reader's Digest and is part of the International Coastal Cleanup co-ordinated by the Center for Marine Conservation in the USA. identities of the major polluters (from data obtained) thus enabling recommendations to be made in order to reduce the sources of marine and beach litter. Marine litter, ranging from plastic bottles, sanitary towels, and crisp packets to strapping bands, fishing line and nets, spoil our beaches and pollute our oceans. But it is more than just a litter problem, marine debris. harms local economies through ghost fishing, lost tourism revenue and repeated cleanup costs. Marine litter comes from many sources including sewage discharges, illegal dumping by ships, direct littering by tourists, discarded waste from fishing vessels and litter carried to sea by rivers and streams. Although there are many pieces of legislation in place which are aimed at reducing this pollution, effective implementation and enforcement is slow. By involving members of the public in the Reader's Digest Beachwatch campaign, understanding of the issues is raised and people are able constructively to express their concern for the environment and their desire to see action taken to prevent marine pollution. Beachwatch is an environmental campaign to monitor litter on Britain's beaches, raise awareness of the issue of marine debris and encourage action to reduce marine pollution at source. Beachwatch is a national beach litter survey and clean up in September involving thousands of volunteers. Each survey provides a snapshot of the amounts and types of marine litter on British beaches and, with continued monitoring, a better picture of the problem and trends over time can be built up. Beachwatch data is used to identify the major polluters and form recommendations for action that will reduce the sources of marine and beach litter. Marine litter, ranging from plastic bottles, sanitary towels, and crisp packets to strapping bands, fishing line and nets, spoils our beaches and pollutes our oceans. But it is more than just a litter problem, marine debris kills wildlife from birds to dolphins, poses a health risk to beach visitors and harms local economies through ghost fishing, lost tourism revenue and repeated cleanup costs. Life around Britain's coast is as colourful and fascinating as that found anywhere in the world's oceans.Yet it is under intense pressure from overfishing, pollution by sewage, oil, toxic chemicals, litter, coastal development and habitat destruction. The Marine Conservation Society (MCS) is the leading environmental charity in the UK dedicated solely to protecting the marine environment. MCS has worked successfully for twenty years to highlight issues of concern and threats to both marine wildlife and to the wider marine and coastal environment, and brings them to the attention of the public, media, politicians and Government agencies alike. Founded following Underwater Conservation Year in 1977, the Marine Conservation Society is the leading environmental charity in the UK dedicated solely to protecting the marine environment. It has worked successfully for twenty years to highlight issues of concern and threats to both marine wildlife and to the wider marine and coastal environment, and brings them to the attention of the public, media, politicians and Government agencies alike. sound scientific research effective lobbying; and publicity and education. Its reputation has earned the MCS a high profile in both Whitehall and Westminster and it provides Government, the European Union and North Sea Ministers with sound, accurate advice. It also has a very high media profile in TV, radio and newspapers, consistently bringing marine conservation to the attention of the general public. The MCS works with other 'like-minded' bodies across the whole range of its work. 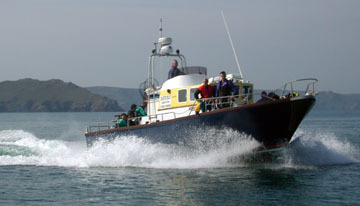 It is a national focus for marine education and training and has a network of local groups. MCS Sales Ltd, a subsidiary company and carries a range of marine biological and other publications. In terms of finance, the highest proportion is spent on conservation, more so than most other environmental organisations. Shipping - MCS has lobbied both the Lords and the Commons seeking amendments to the Merchant Shipping & Maritime Security Bill to tackle illegal dumping of waste at sea and is an adviser to Government on the Maritime Pollution Action Group. Oil & Gas - MCS has exposed the poor state of environmental regulation of the UK offshore oil and gas industry and has secured a Labour Party commitment to undertake a thorough review. Beaches - The Marine Conservation Society's Beachwatch '97 survey involved thousands of volunteers and surveyed over 200 UK beaches. 1997 has seen the tenth edition of the only independent guide to UK beaches, the Good Beach Guide. The Marine Conservation Society's Adopt-a-Beach scheme continues to grow as more UK beaches are 'adopted'. Species Protection - The ten-year Basking Shark Survey run by MCS has put forward the evidence required to get the Basking Shark protected under the Wildlife & Countryside Act. MCS has pressed for particular marine species to be added to the list of protected species under the international CITES Convention. Marine Nature Conservation - The Marine Conservation Society has lobbied hard to ensure more marine SACs (Special Areas of Conservation) get protection under the EC Habitats Directive and has used its experience with voluntary marine conservation to assist in the management planning for SACs. Coral Reef Conservation - 1997 was International Year of the Reef and the Marine Conservation Society played a major role. It produced a Coral Code for tourists and divers to use when visiting coral reefs, a factsheet pack and slide set to help educate and raise awareness, and a video to be shown on outgoing holiday flights to the Red Sea, warning divers about the need to protect reefs from damage. The Marine Conservation Society is also carrying out coral survey work in the Red Sea. Marine Pollution Control - MCS has uncovered inadequate monitoring by the Environment Agency of coastal pollution discharges from sewage works and industry and is campaigning to ensure EU Directives on coastal pollution are complied with to timetable. The Marine Conservation Society is also opposing the use of the pesticide, Ivermectin, in Scottish salmon farms. Education and Training - MCS has run exciting new courses, including "Oceans of Fun" - a special course on interpreting the marine environment for children. The popular Marine Conservation Society Study Pack for Schools has been updated and a bilingual Seashore Code produced for Wales. The BOC Oceanwatch programme for schools has been developed to meet the needs of geography teachers. Today, the Marine Conservation Society works across an even wider range of marine issues than ever before.